Yoko and I have been together now for one year and to celebrate, we went to eat at this Korean restaurant out where Neal once lived. It's not terribly authentic as it has the quiet Japanese restaurant vibe and nobody shouting. The food was not that bad, I thought, but not nearly hot enough though. Still, it made me miss Korea again and want to go back as soon as I can. 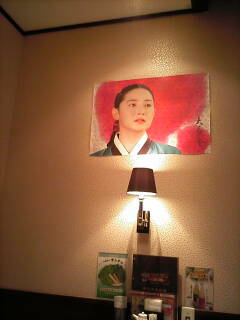 There was a poster up from this Korean soap opera that Yoko watches religiously, every Saturday night at 11:15. I just can't get into it, but Changumu is working hard in some King's palace, best I can tell, and these evil women with braids are always keeping her down. And there's like this evil cousin figure too. Like I said, I don't do a great job of keeping up.